Despite 26 meetings over two years, firefighters have not been able to reach an agreement with ESA. File Photo. ACT firefighters will take protected industrial action on Tuesday morning (26 March) after failing to reach a pay deal with the Government. Firefighters rejected a package in December last year that would have stripped away key conditions of employment in exchange for a pay rise. The ACT United Firefighters Union rejected the 10 per cent pay rise offer and insisted that funding should be invested in safety instead. ACT UFU branch secretary Greg McConville said firefighters had “overwhelmingly voted” to take protected industrial action starting at 8am on Tuesday. “We simply do not have enough firefighters to cope with increasing demands, many fire stations require renovation, new fire stations will require staff and our training needs to be updated,” he said. “A firefighter’s job is a to save lives and it’s a job they take very seriously. They can’t do that job if they are overworked, understaffed and lacking in resources and equipment. 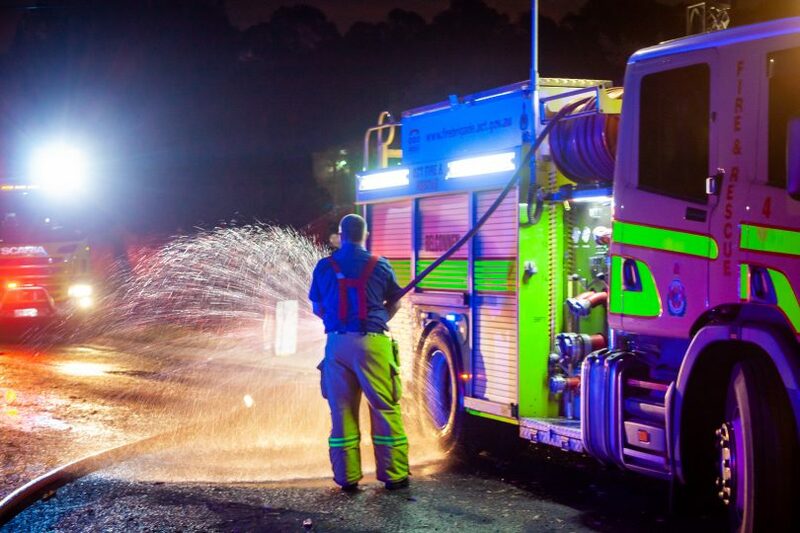 Mr McConville said despite 26 meetings over two years, firefighters had not been able to reach an agreement with the ACT Emergency Services Agency over their new enterprise bargaining agreement. Mr McConville said that protected industrial action would be administrative in nature and directed at the ESA without compromising community safety. “ACT firefighters have said loudly and clearly to the ACT Government, keep the pay rise, invest in safety,” he said. “As a result of the ESA’s uncompromising stance, firefighters will commence protected industrial action from 8 am Tuesday 26 March. Mr McConville said the union was keen to meet with the ESA as soon as possible and that any change to the bans would only occur with the required minimum notice of at least three days. A ban on assisting in the preparation of ministerial reports. I’m a member of a ACTFR Community Fire Unit. not a union what they have said to the gov is Quote: “They can forget the pay rise, Invest in safety…” I’m a ACT urban fire service today is lacking in new equipment…Fire stations need to be renovated/built, they need a New aerial pumper, they need more firefighters, They need new Protective clothing, training etc. Because without these the community is at risk. A 10% pay rise in this economical climate where the maximum allowed in Govt departments is 2% seems overwhelmingly generous so I wonder what the conditions are that they are losing. Would it be the allowance they get if they don’t get to eat their meal – the spoiled meal allowance- or the rostered overtime shifts. I also wonder what other people think about why in these times of fiscal efficiency they are allowed to sleep during their night shifts and still receive their wage and entitlements. No other emergency worker can do this and I’m sure there are training, maintenance and administrative tasks that can be conducted in this time so they can ensure that their stated primary focus of community safety is maintained. I am nearly 100% sure only ACTAS Paramedics get a spoilt meal allowance. As for being able to sleep if someone is rescuing me from a bad situation eg a car crash or fire I would be more than happy to know they had been able to get a little rest so that their ability to make critical choices about my safety was not completely sleep deprived, and I would rather they were “sleeping” on station rather than waiting the extra time while they drove to station to then respond to say a trapped person, as what occurs in areas that are covered by retained or volunteer stations. ACTAS may but ACTFB definitely do. You do know that the shift is spent at the station don’t you so there is no travel time to the station? Do you know anywhere else where you sleep for your work shift? Anyhow, Police and Ambulance work irregular hours and don’t get to sleep their shift away and would arguably have to make more imperative decisions in various time critical situations and the expectation is that they manage their own fatigue levels. The point being is that in these days of increasing efficiency and accountability of performance a 10% increase is substantial and there would reasonably be an expectation of increased performance for that. An aspect of that may be being active on the designated shift instead of asleep which would be morally and financially ethical and also more available to help you in your car crash. Guinness you sound bitter and uneducated about what exactly ACTFB really do. Firies in ACTFR definitely do not get a spoilt meal allowance. You can find our certified agreement here. I can confirm ACTAS only get the spoilt meal allowance, they also can sleep on station when not attending incidents of a night. When you look at the 10% increase 5% of that was to remove a clause from the agreement that stated changes to work practices must be agreed on by both parties, the government want that changed to consulted, given how this government consults with other parties and then ignores the consultation process and does what it wants I don’t blame the firies for saying no. I don’t know who told you ACTAS paramedics get a spoilt meal allowance but they are wrong, it was taken away years ago. As for sleeping on station at night, with a 7% increase in workload every year, the amount of time available to sleep during a 14 hour night shift is rapidly diminishing. If you look at the JACS annual reports, it shows that one of the largest increases in workload for ACTF&R is medical assists, i.e. helping ACTAS with it’s workload. What theyre saying to the gov is that they can forget the pay rise INVEST IN SAFETY. ACT urban fire service today is lacking in new equipment…Fire stations need to be renovated/built, they need a New aerial pumper, they need more firefighters, They need new Protective clothing, training etc. Because without these the community is at risk. My partner is a firefigther in ACT. They definitely do not have a spoilt meal allowance. Fiscal efficiencies, Economical climates, and Gov departments having a 2% maximum? Not sure where you are from guinness, but you are definitely out of touch if it is Canberra. The ACT Labour Gov made an election promise to continue wage growth at an equivalent rate to CPI, and not surprisingly? Labour were re-elected. Currently the Whole of Government pay offer is 2.75% per year, split in 1.35% increments. How’s that for a 2% cap? Being from a family of Emergency Service workers, my dad was and my brother still is a paramedic. They also sleep on station at night… and I am also okay with that. I think it is far more important that they are as well rested as possible before they begin pumping on someone’s daughter’s chest, administer the right amount and type of drugs to someone’s best friend, deliver a sister’s premature baby, cut someone’s son out of a wrecked vehicle or rush into a fire to save a dad. I would much rather them getting up as rested as possible, ready to perform their critical functions – as opposed to having them brain dead after 12 hours of administrative duties on a computer. I do it for 8 hours a day and I come home tired, mentally drained and fatigued. Unfortunately I must admit that after work I have on occasion fed my dog with cat food, and I even once fed the cat some fish flakes… at least my mistakes did not have fatal consequences. While I think it is great to have debate, I also think it is rather embarrassing to throw accusations and suggestions about things that are definitely not true.